HolyJuan: Thank you Lia. Thank you Meshell. Over a year ago Lia suggested I start this site. I thought she was nuts. Soon after the site was up, she suggested I get business cards. I thought she was nuts. 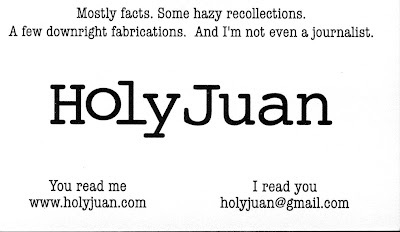 Last night, as a complete surprise, Meshell gave me a box of the HolyJuan business cards we had been designing. You can print these up and hand them out to your friends and/or enemies. I am handing them out all over the gulf coast as we speak! !